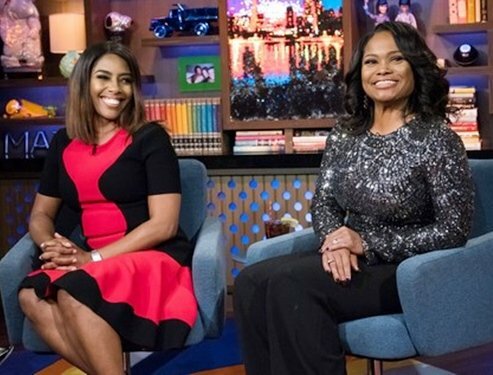 Aside from getting the shaft from Bravo and being moved to Friday nights, Married to Medicine gets little to no shine from the network. If this is one of the two best shows on Bravo right now, where is the love? Things we learned on last night’s episode of Real Housewives of Orange County: 1) Heather Dubrow is afraid of Tamra Barney. 2) No one else is afraid of Tamra as they realized there is power in numbers 3) Vicki Gunvalson‘s plastic surgery has rendered it virtually impossible to cry (can we get this woman on Botched already?!). 3) You reap what you sow – whether it be rice or karma. The ladies are in Bali and things were supposed to be rejuvenating. They were if you consider that coconut water is practically on tap there, but the company was just as negative as always! We witnessed a two-pronged dinner fight, that went into several acts last night. Shakespeare would be so proud of our Bravo editors! Dinner Act 1 featured Tamra squaring off against Lizzie Rovsek over fashion backstabbing and birthday ditching. Tamra fled the table, which is a serious sign of weakness in the Housewives kingdom and it let Lizzie know that Tamra is vulnerable so she fortified her mutiny. The next day there is a clear divide between the Old Guard (Tamra, Heather, and Vicki) and the New Gals (Lizzie, Shannon Beador and that silent one – Mute Wide-Eyed McPout Dumberson). The agenda is playing with monkeys, touring a temple, and shopping in the market. Old Guard is dressed to the tropical nines. Heather’s dress was fabulous; humidity does not exist in the carefully calibrated perfectly controlled world of Heather – is she some sort of Housewives superhero? The New Gals were in workout gear – Lizzie practically wore a bikini as Tamra sneered that booty shorts aren’t appropriate for a temple. Ironic considering Tamra was also wearing booty shorts. Luckily the temple was booty short prepared and forced them to put sarongs over their clothes. This week on Real Housewives of Orange County, the ladies, plus Tamra, kicked off their big trip to Bali. Call me crazy, but if I’m going to invest 25 hours of my time to travel somewhere, it wouldn’t be with people I don’t get along with, people I merely tolerate, and/or people I flat out do not like. Gotta love Bravo. Vicki Gunvalson‘s dramatics aside, the trip started with promise. As Heather Dubrow said, it took 24 hour for the yelling to begin, that is a win! However, thanks to tension between Lizzie Rovsek and Tamra Judge, everything went to hell their second night in Bali. Whenever the Real Housewives of Orange County travel it’s an elephantine-sized disaster. And this time they came into contact with actual elephants. I’m pretty sure subjecting an elephant to Vicki Gunvalson‘s screaming constitutes animal abuse. Last night they all traveled to Bali for some spiritual awakening, reincarnated relationships, and bonding – at least that was on the trip prospectus. Bali is being terrorized by California ladies with 25 pieces of designer baggage and enough anxiety drugs (they’re holistic!!) to tranquilize an elephant. The real purpose of this trip is for us to get different scenery while they haggle and rehash over the same dang arguments. Vicki has a conniption fit because she thinks all the calming auras in Indonesia will interfere with the WiFi signal so she won’t be able to WORK! WORK! WORK! More time to FIGHT! FIGHT! FIGHT! (or in Vicki’s case get motion sickness and puke in Tamra Judge‘s lap in the back of a van). After 30 hours on a plane everyone, including that silent one Danielle Gregorio, arrives. She is now called “Dumb” as in 1/2 of the Vicki-dubbed Dumb & Dumber. She was wearing a molting Muppet costume on the plane. I seriously wonder what happened with this one. Why is she the RHOC ghost? I feel like a Sc0oby Doo montage starring Shannon Beador‘s mystery door needs to breakout! On last night’s Real Housewives of Orange County, poor Lizzie Rovsek proved she is unpopular with the ladies and Shannon Beador forgave Tamther (an ill-advised move) in order to get a free vacation in Bali. Things begin with Tamra Barney telling Vicki Gunvalson about Ryan’s surprise engagement. Vicki understands given that Briana surprised eloped last season. If your children are always hiding something from you that’s probably a sign that they think you’re crazy. However, quickly talk turns to The Shannon Beador Dilemna. Vicki is straight to the point with Tamra that she started causing all this drama and now is stepping back like ‘Don’t look at me! I didn’t do it!’ – and that Heather Dubrow is also being an instigator. Vicki thinks Heather needs to be knocked down a a notch or two to understand empathy. I am loving this equanimous Vicki. More of this please! Less of that rat’s nest on her head that she calls hair, however! I don't even know what to say about last night's episode of Real Housewives of Orange County. It was surprising – to say the least – surprising in that it featured real emotions and a storyline that did not seem entirely crafted by producers. Sure, there were moments that seemed 'encouraged' but the reactions of the women to the circumstances seemed deliciously authentic – which makes the episode both incredibly sad, and incredibly engaging to watch. In short, this is one of the most interesting episodes of RHOC I've seen in a while, except for the revolting Vicki Gunvalson and Brooks Ayers scenes. Last night on Real Housewives of Orange County a certain Heather Dubrow got a taste of her own medicine. No, I don't mean she was forced to wear Target clothing, I mean Tamra Barney shanked her with some petty, made up reasons to hate while at a party and Heather became the new Gretchen is the new Alexis. Stage an intervention to call someone fake, wind up in an intervention being told you're fake (and condescending!). See, it's a dog eat dog world that Andy Cohen created and you have stab someone with storyline drama before they can stab you. Alas Heather considered Tamra her a 'real' friend. Boy was she wrong, because you can't teach an old dog new tricks. But at least Vicki Gunvalson behaved decently… for a change! So yes, Shannon Beador and Heather think their holiday cards are on par with the White House's in terms of preeminent importance. Shannon tells us that people look forward to her card every year and Heather gives a gushing speech about what it represents to her family (Time immemorial? Neil deGrasse Tyson joke!). They both hire full glam crews and professional photography teams to make these visions come to life. I think I saw Anna Wintour scuttling around behind the ladder in Heather's shoot. It's nice to know that I have some things in common with these two wealthy beacons of the upper echelons – because even though I take my holiday photo with an iPhone, my kids misbehave just as much as Heather and Shannon's do! Anyway, Heather is taking her card in what looks like the parking lot of a storage facility. Maybe since they're between mega mansions she's going for homeless chic?